Boozy Salted Caramel French Toast: Can't you just imagine a Sunday morning full of Hazelnut coffee, french toast, and morning snuggles? Nothing better. DIY Fall Decorations: There's just something special about decorations, and with me hoping to get a nannying job… I need creative ways to keep them occupied ;) DIYs like these just make me wish I was living in my own little apartment..
Hooray for fall! That french toast sounds so good. Such a cute moodboard! Love it! Yay!!! I love fall so much!!!! Love everything on your board! Fall is my favorite season! Love everything on this board! Salted caramel french toast? What on Earth?! That sounds incredible!! Also, the glittered/gold-painted Autumnal leaf looks ever so beautiful, I've got to try doing that! I am so excited for suede skirts! Love this! I am all about the suede skirts, they have a fun 70's vibe to them! The french toast and your description of a Sunday sounds absolutely wonderful! I'm so excited for fall! I need a suede skirt! 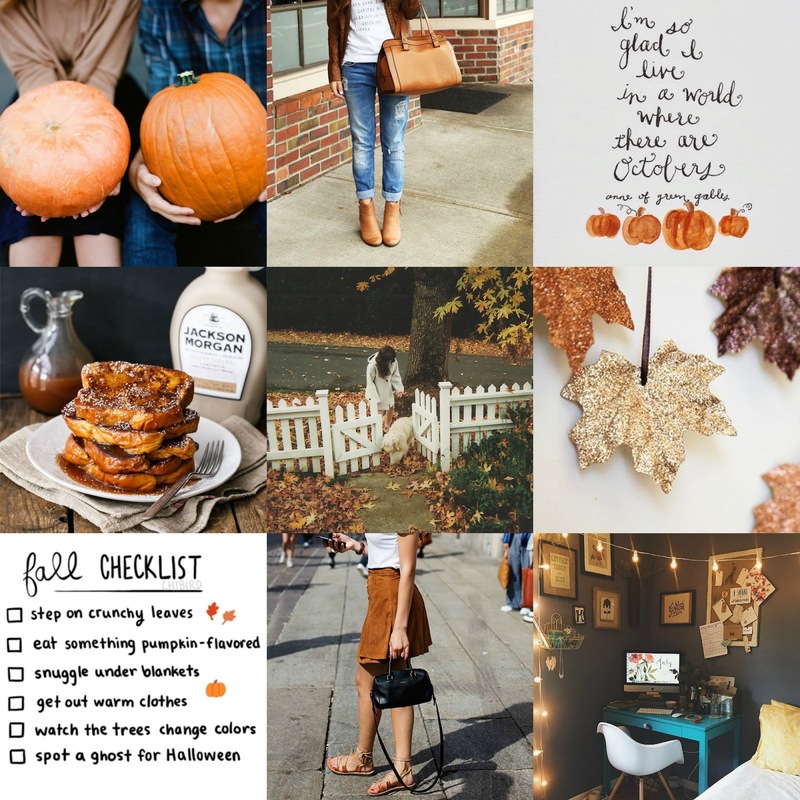 Great fall mood inspiration board! It's my favorite season, I love all the rich colors. Hi dear, so nice post!!! I found today your blog!!! LOVE all these fall things!! So glad I found your blog! Can't wait for fall to come finally! This is a great board! We are the complete opposite because I rarely wear dress and skirt. LOL! I am really glad Autumn is finally here, Summer was too hot with the crazy heatwave. You did a great job with this mood board, really love it! yes fall.. i am so ready! cute post dear!! i love everything! Fall makes me so happy! Thanks for brightening my day with this post! I love fall! Little behind where I live, but I am so anxious for the season! All about your fall moodboard.